The musical-themed vibes of Austin now extend beyond its city center. This fun and energetic city, recently named one of the best cities in the country for young professionals by Forbes magazine, has added a new architectural landmark. Curved steel shapes in the form of a gigantic 45ft guitar greet you outside of the baggage claim area of Austin-Gergstrom International Airport. This curved steel shape is made completely from structural steel and glass. This welcoming artistic landmark sends a clear message about the kind of city to which you have just arrived. It serves as the bus stop that will get you downtown in about 15 to 20 minutes. 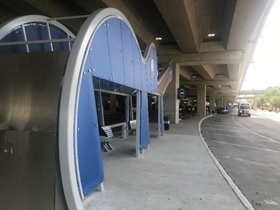 The project was a collaboration between the City of Austin Department of Aviation, Public Works and CapMetro. The shelter’s designer was RS&H, Piatra Inc., who envisioned this larger-than-life guiltar. 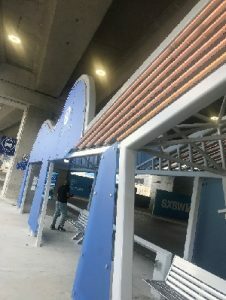 The construction also included sidewalk and accessibility improvements, benches, charging stations, and a 55-inch touchscreen monitor. The outline of the curved steel shaped guitar is constructed of 6-inch carbon HSS square tubes with a 3/8 inch wall. The pieces are rolled to multiple radii varying from 3-feet to 20-feet. Achieving the look of a continuously rolled piece was extremely difficult and required a tight collaboration between design team, Chicago Metal Rolled Products and the fabricator. The different pressures needed for the different radii can cause deformations on the cross-sectional faces of the tubes causing connection problems between the tubes. The pieces were blended together so well that you cannot see any splices throughout the structure. Without a doubt, Austin’s economy is growing at a rapid pace. Just this past year South by Southwest (an annual music festival) reported that it had a $350.6 million impact on Austin’s economy. 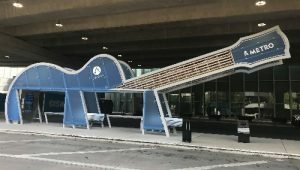 So next time you visit Austin, whether it be for a music festival, work or both make to visit and admire this bus stop that truly is a piece of art.